Today is July 1st, and besides being the first day of a short work week we’re all riding out to get to the fireworks, barbecue and beer, it also marks a significant milestone for homebrewers. Today, a law legalizing homebrewing goes into effect in Mississippi, which was the last bastion of backwards brewing bans. 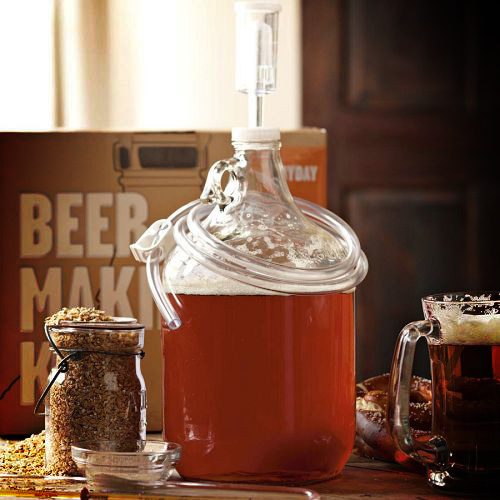 That makes today the first time since the end of Prohibition that you can brew your own beer anywhere in America without Johnny Law kicking over your brew kettle and putting the bracelets on you. While this landmark event for homebrewers has no official title, I think it should be celebrated as “Common Sense Day” or “What the Hell Took So Long?! Day” or maybe “This Should Have Happened in 1978 When Homebrewing Was Federally Legalized Day.” I think that last one has a nice ring to it. The American Homebrewers Association is so thrilled that homebrewers in all 50 states can now legally take part in that passion, they released a statement by their director Gary Glass, who said, “The AHA is thrilled that homebrewers in all 50 states can now legally take part in that passion.” I told you they were thrilled! So congratulations to all of you Mississippi homebrewers out there – you are now free to have your rig mistaken for a meth a lab! Ha ha – you’re right on the money, Wayne! Good for them. Now they need to pull their collegiate home boy, Eli, back to help promote the cause. How else is Ryan Nassib going to a chance to see anything other than the a clip-iPad? Good news – they got rid of the permit requirement! Not that anyone bought the permit anyway, but as long as you’re under 200 gallons a year in NJ, you’re good to go. Sorta takes the rebel feeling away from brewing though. well then I guess I’ll have to start distilling! Naw – spend it on brew beers! I thought everyone had the right to keep and brew ales. Yet Mississippi has had casinos operating in the Magnolia State for years, making the homebrew restriction all the more anachronistically Victorian. I was stationed in Biloxi during the late 70’s when the drinking age was 18, and you could drink AND drive…… legally. Just as long as you weren’t drunk, you could enjoy a cool one while cruising down the highway. But try and brew some beer at home and that is against the law. Great, now I’m insane. But casinos make money, brewing beer at home SAVES money. the gubmint don’t like that! I’m late to this, but exciting news for America. Did anyone see this reported on Foxnews or CNN?